It’s a dream at the Wisconsin Humane Society to have a Going Out of Business Sale. It would mean that our work is done. All animals would have a loving, committed family with the resources to care for them forever. Everyone in our community would value animals and treat them with kindness and respect. While we’re on the right track, WHS is not yet ready to go out of business. But we can help animals find loving homes even faster this spring, by rolling back our adoption fees for dogs and puppies (some to levels not seen in over 6 years!). “The community is still pulling out of the economic downturn and we have found that reduced fees are an incentive for some families looking to add a new furry family member to their lives,” said Alison Fotsch, counseling services manager. Fees still vary by dog, and most Rollback fees range from $109-289. Each dog’s profile reflects the reduced fee. View dogs and puppies at wihumane.org. Included in all dog adoptions are spay/neuter surgery, first distemper vaccination, initial deworming, micro-chip implant, heartworm testing, a certificate for a free veterinary exam, and a 30-day gift of ShelterCare Pet Insurance with a valid email address. 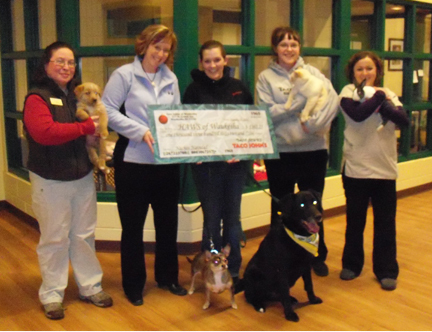 HAWS, the Humane Animal Welfare Society of Waukesha County, has received a donation of $1,362.25 from Taco John’s of Waukesha, the result of the restaurant’s December “Nachos Navidad” promotion and sales of Christmas ornaments which were hung at the store at 317 N. Grand Ave.
Pictured during the check presentation at the HAWS’ shelter are Angela Ng (HAWS) with puppy Rowdy, Jennifer Smieja (HAWS), Taco John’s Dusty Stiefel and Becca Monson – with HAWS’ adoptable cat Kringle, Amanda Heyck (HAWS) holding Zelma the rabbit, and HAWS adoptable dogs Misty and Marley (seated in front). HAWS, the Humane Animal Welfare Society of Waukesha County, will again join HSUS, the Humane Society of the United States, to observe Spay Day 2011 on February 22. Free spay-neuter services will be available at HAWS to qualifying Waukesha County residents during the last 2 weeks in February. HAWS also invites greater community awareness and support through “Sponsor-A-Spay” donations and the sale of limited edition Spay Day ’11 t-shirts at the shelter. From February 14- 25 the Spay-Neuter Initiative Program (SNIP) clinic at HAWS will provide free spays or neuters for the pets of qualifying Waukesha County residents. Applications for the surgeries can be obtained on the SNIP webpage or by stopping by the shelter. Olenik continues: “This event gives us a chance to promote our SNIP clinic and the impact it has within our community on pet overpopulation. It also allows us to stress the importance of services like our Outdoor Owned Cat Program – the grant-funded program that sterilizes barn and feral cat populations in Waukesha County without cost to property owners.” Olenik notes numbers of stray kittens coming into HAWS have dropped over 10% since the outdoor cat program began in 2005. “Everyone can get involved in Spay Day, by promoting spay and neuter for pets and with their financial contributions,” said Olenik. “Any donations help!” Call the shelter or visit www.hawspets.org to help. Get $10 off any dog, cat, or rabbit adoption fee at the Wisconsin or Ozaukee Humane Societies if you are wearing any Packers attire, through February 6! Steelers gear will not cut it. Adoption hours on Superbowl Sunday at WHS will be 10:00 a.m. to 4:00 p.m. to accommodate fans. The Ozaukee Humane Society is closed on Sundays. Jessica is one of many puppies at WHS looking for a new family. Got extra room on your couch? View all the puppies and dogs available for adoption today at WHS and OHS. MILWAUKEE, WI – Animal Fairy Charities, Inc., with a mission to foster national and international prevention of cruelty to all animals and aid in their safety and welfare, announced that The Animal Fairy, the title character in an October 2010 book designed to teach compassion to children, will make an appearance at the 2011 Great Lakes Pet Expo, Sat., Feb. 5, from 10:00 a.m. – 6:00 p.m. at the Wisconsin Exposition Center at State Fair Park. The Animal Fairy, written by Shelley Abrams, illustrated by Susie Weber, and the first of a series of children’s books published by Animal Fairy Charities, teaches children lessons of kindness and compassion for all living creatures that will stay with them for a lifetime. The title character will be at the Great Lakes Pet Expo in booth 803 signing copies of the book, plus taking photos with children and parents. Proceeds from the book sales will help feed, shelter, transport, and provide medical care to animals. Tickets for the Great Lakes Pet Expo are available at the Wisconsin Exposition Center box office, $6 for adults, children 10 and under $3. With more than 200 exhibitors, there is live entertainment on three stages, plus a reptile area dedicated to providing education on various types of reptilesand amphibians. Animal Fairy Charities, which raises and distributes funds in support of the missions of other animal non-profit organizations, educates and engages children through positive interaction with animals. An educational and developmental organization that produces programming on Animal Advocate Television, the group provides information regarding the betterment, safety, and welfare and prevention of cruelty to all animals. For more information, visit www.animalfairycharities.org <http://www.animalfairycharities.org> . Join us for a pregame party that is going to the dogs!! Packer “Pup” Rally Thursday, February 3, 2011 from 4-6pm Spa Paw and Tail 5055 S. Emmer Drive New Berlin, WI. Bring your best friend in for a “Packer Photo Shoot” ! Photos are $15 each and all proceeds help the animals at Elmbrook Humane Society. Commemorate the Green Bay Packer’s trip to Superbowl XLV with your very own Packer puppy photo. GO PACK GO!